Thanks to news agency Al-Jazeera, people are using online video to share their stories with a global audience. They do so from some of the world's biggest hotspots, creating content that's compelling, startling, and often troubling. Letting people upload their own news videos is nothing new: CNN, for example, has offered its iReport feature since 2006. Al-Jazeera began experimenting with its Sharek portal (which means "share") in late 2007, so it was well-positioned to capture striking first-person views during the Arab Spring uprisings of 2010 and 2011. Al-Jazeera has now taken its citizen journalism portal a little farther, with a redesigned Sharek portal (still at http://sharek.aljazeera.net). Regular contributors can now become accredited. Once they've attained that trusted status, their videos will post without moderation. Al-Jazeera's work in citizen journalism came as mobile devices with video cameras began taking off. "We aim to be a voice to the voiceless, and empowering people on the streets or anywhere in the world to voice their own stories is what we try to do," says Riyaad Minty, head of social media for Al-Jazeera. "It's all about empowering people to tell their own stories. That's, I think, the philosophy here. The technology was probably mature enough around about 2008, with journalists being a bit more open to the idea, so that was the right time. I think everything just kind of came together." The portal has allowed Al-Jazeera to cover a variety of stories in places where reporters were neither safe nor welcome. "In a lot of places, if you look into Libya or into Tunisia, at times we can't have reporters on the ground as extensively as we wanted to. Many times we were kicked out. Bahrain, too: We didn't have any reporters on the ground, so people were able to submit to us their own perspective of what happened. We were able to then verify this and make it onto the screen," says Minty. 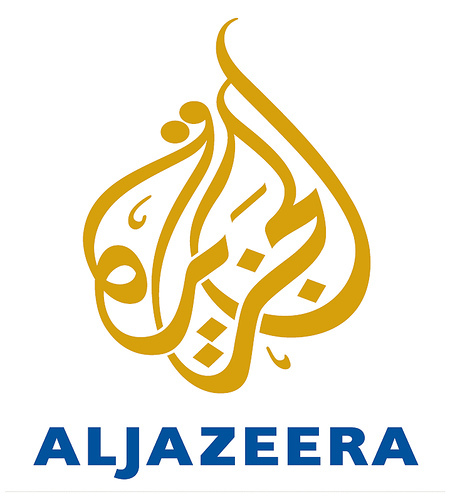 Citizens can submit videos to Al-Jazeera through email or the smartphone apps the agency has created. For those with less advanced phones, Al-Jazeera also accepts reports through SMS. "In some cases, we even work with SMS technology, and we've done this in Somalia, for example," says Minty. "We have a database people can send SMSs to. Obviously, it's not as great as images or videos." The uploaded video has brought all the blood and turmoil of Mideast uprisings to light in a more personal way than was possible before. Gaza War attacks from 2008 were the first major test of the system. "I think the first sort of footage that we got was during the Gaza War at the end of 2008 and in early 2009," says Minty. "I think that was probably the first time we really started using the platform actively and the first time we received footage from the ground. One of the first videos that I saw, there was a missile attack on a building. The building had collapsed and people were stuck under the rubble and someone had a mobile phone and was running around filming the people trying to take the people out. People were crushed and buried under buildings." With incoming footage like that, vetting the video is especially crucial. With the first Sharek portal, all video was hand-screened prior to being used. "Everything that comes in gets screened by someone from my team," says Minty. "They'll go through it and first try and verify the location-that it was, in fact, where the people said it is. They'll listen to accents. They will then decide whether or not it's too gruesome to post online. If it's too gruesome, it gets archived. If it's not too gruesome, it will be posted on the website. Our team goes through it to decide if they want to use it on TV, then to start getting a lot more context around it. That's kind of at the heart of what we try to do, at least in TV and on the web, with the citizen video ... provide context around a story. Just getting the video, you know, it's telling you what's happening right here, right now but it's not telling you why it's happening or what happened. So then our TV teams will do a lot more investigation before broadcasting it, and if it's editorially viable and it links into a broader story they'll then use it onscreen." 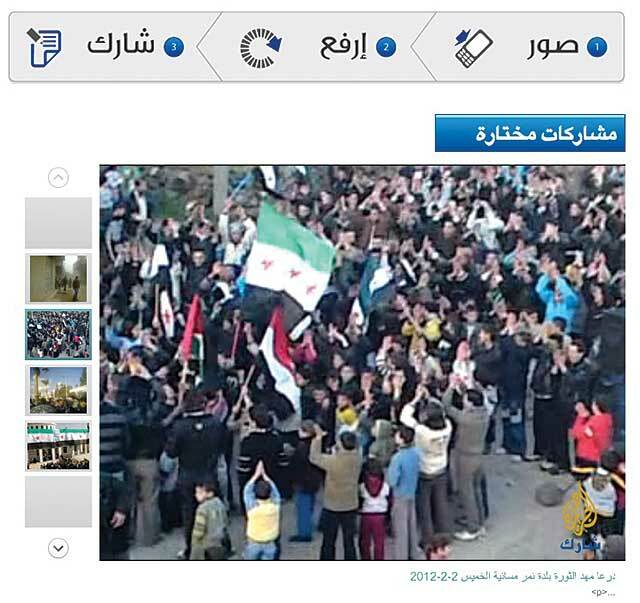 Only about 10% to 15% of uploaded video makes it to the Al-Jazeera website. The Sharek portal received a major boost with the domino effect of Mideast demonstrations and protests known as the Arab Spring. As civic uprisings swept through Tunisia, Egypt, Libya, Yemen, and many more countries, Al-Jazeera was there to receive the historic first-person footage. "As the Arab Spring started happening end of 2010, early 2011, we saw a major increase in the type of content that was sent through to us and we were forced to scale incredibly," remembers Minty. "At times we were getting up to a thousand videos a day from people who were protesting in the streets. A lot of this footage was driving our coverage onscreen and online. "Over the past year we've received close to 70,000 videos sent through to us; a lot of them good, a lot of them, you know, you can't use." Because Al-Jazeera had been working with its Sharek portal for years at that point, it was able to scale up efforts and meet the wave where other news organizations failed. "I think a lot of these organizations reacted to a certain burst of content coming online, and they were struggling quite a bit with that. We've been doing this for quite a while so it's been very much at the core strategy of what we have been doing," said Minty. "I have been working in a media team that was formed as early as 2006, looking at what the future of media would be like. Having the platform ready and training our staff and journalists meant that when the Arab Spring happened we were well prepared." As videos came in from Egypt, Bahrain, and Libya, the Al-Jazeera staff and the rest of the world experienced major events through the lenses of citizen journalists. "The video we got of Gadhafi was a citizen video, the final video that showed that Gadhafi was killed; that was someone who recorded on a mobile device and gave it to us," says Minty. Much of what was uploaded was simply too graphic to post. "A lot of it wasn't broadcast," says Minty. "A lot of the content we get is gruesome. It won't make it to screen or to our websites. A tank opened fire on a building just recently. What happened in Houla, in Syria, you know, with the children. We had pictures and videos of people with their heads blown off just about." While Al-Jazeera viewers won't see that material, Al-Jazeera editors do. Living with those images can be difficult. "It is a challenge," notes Minty. "I don't think you ever get used to it." While the Sharek portal has been a huge success, Al-Jazeera's editors have decided it's time for a refresh, one that brings in new features and abilities. "It's not just a way for us to gather content, but it becomes its own functioning community of citizen journalists and people who want to express themselves and tell stories, interacting with each other," says Minty. "That's where the idea for the new platform came out, which is something we've been working on now, I think, for the past five or six months quite actively. We're hoping to launch in June this year." Community is at the heart of what Al-Jazeera has planned. "The first one was initially just focused around content and people submitting content through to us," says Minty. "The new portal is very much around the community. The challenge was how do we not duplicate work across channels, creating an easy workflow so all channels can access content in the backend and focus on its region of expertise. So the backend is streamlined across all our channels; that was one of the first needs. The second one is obviously the community: We want it to be about the people. We want to encourage people to tell stories. The new portal is also going to be a lot more editorially driven. We will be putting assignments up depending on our editorial focus and our news cycle. Are you affected by this story? Can you submit content to us? It will enable people to discuss the events, so it's all about the community and people. That's really the biggest difference between the two." Along with a focus on community, the new portal will let frequent uploaders attain a trusted status, one that earns them special privileges. "We're building trust rankings into this portal, although we're still working out exactly what these badges would be and how people would earn the various levels of trust rankings. At the highest level people can moderate content. So, if someone is a very trusted contributor-their content is verified often, we use it onscreen and it's relevant to our audience- that person would get a good trust rating and that would enable the content to be published automatically. That's a big shift from where we are right now, where everything goes into a moderation queue. Also, the community will vote up or down on users and the type of content that they submit. That should empower the community and encourage people to submit more accurate information to us." In time, the redesigned portal will be available in 12 languages and will be used by people around the world. So whether a citizen journalist's hotspot is in the Mideast, South America, Europe, or even North America, they'll be able to contribute.